Are you looking for a fun and easy Christmas treat that the kids will go wild for? 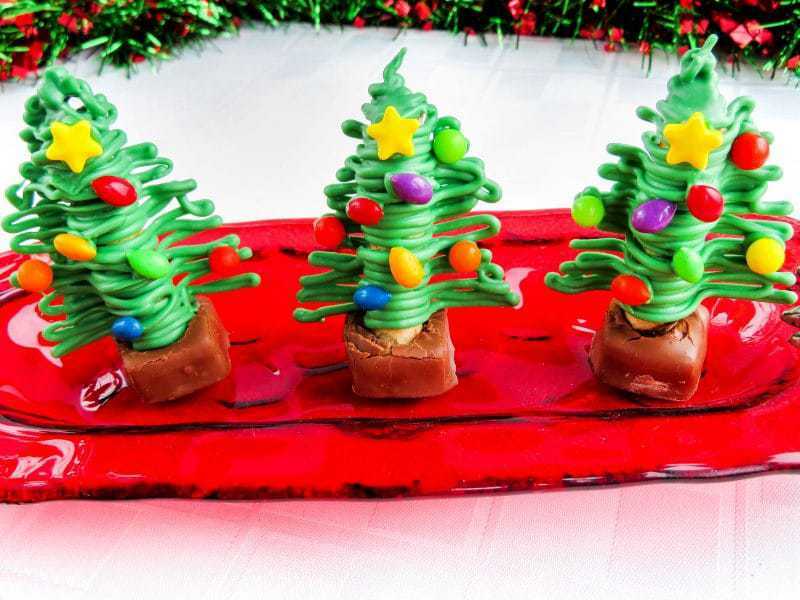 These Christmas tree treats are perfect! They are super cute and look impressive too. Only you’ll know that it took only seconds to make each one! We used candy coated sunflower seeds, candy balls, and candy stars to decorate our Christmas trees. If you have a difficult time finding these particular candies, you can use M&Ms, sprinkles, or whatever other candies your heart desires. 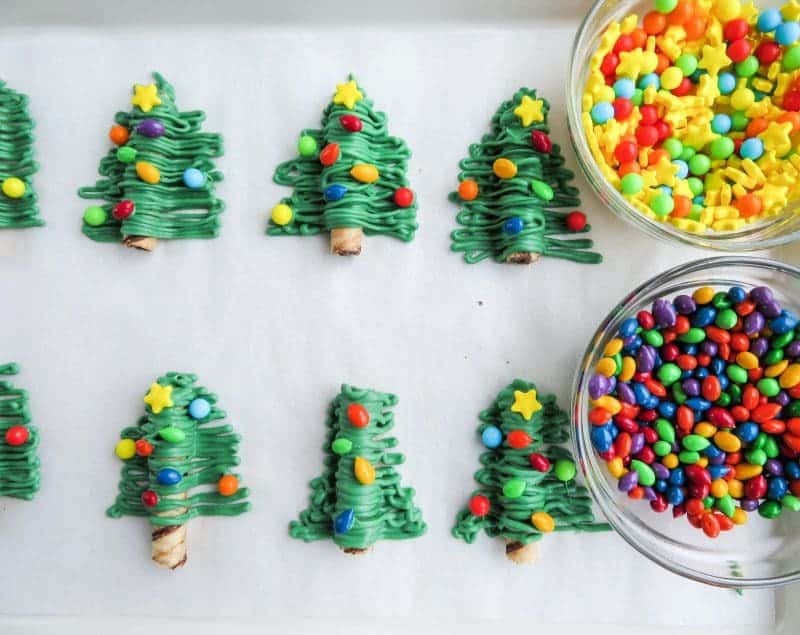 The kids will have a blast helping to decorate these Christmas tree treats. This is the kind of recipe that will inspire your kids to create even more fun things in the kitchen. 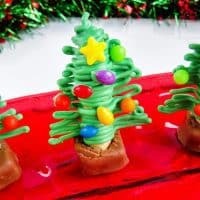 While these Christmas tree desserts are perfect served on their own, they make great edible Christmas decorations as well. You could place these randomly around your dessert buffet . 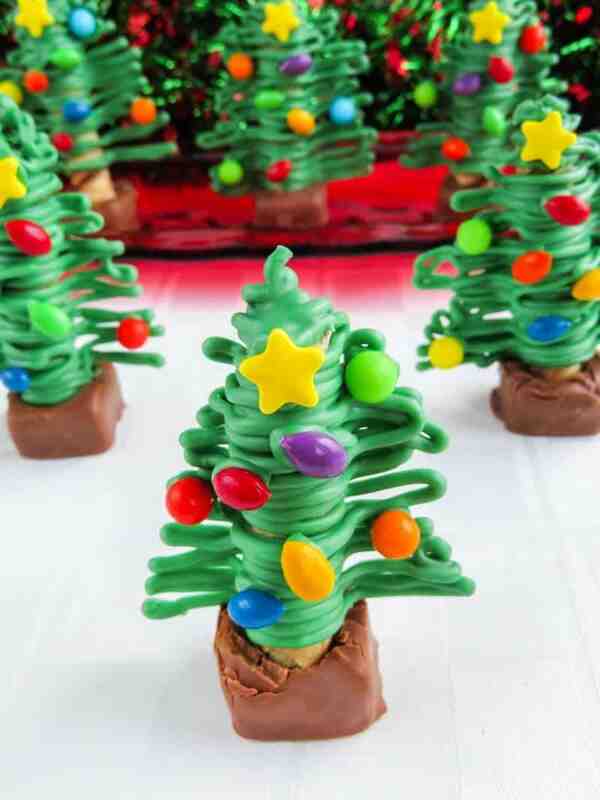 You could also use the Christmas tree treats as cupcake toppers. Or, the Christmas trees would be absolutely gorgeous setting on top of a layer cake. The ideas are endless! This is such a fun recipe that everyone is going to have fun making. It’s also a delicious recipe that everyone is going to love eating. You could place the treats in cellophane bags to give away as gifts or use as stocking stuffers. They would also make the perfect addition to a holiday gift basket. One thing is for sure, whatever way you choose to enjoy or gift these delicious Christmas tree treats, they will be huge hit! A printable version of the recipe is included at the bottom of the post for your convenience. 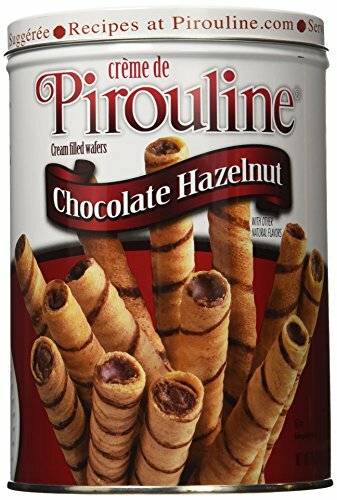 First, cut each Pirouline Wafer in half and lay them on a parchment lined cookie sheet. Make sure to leave enough space in between each one to add the chocolate. Melt green candy melts in the microwave (at 30 sec. 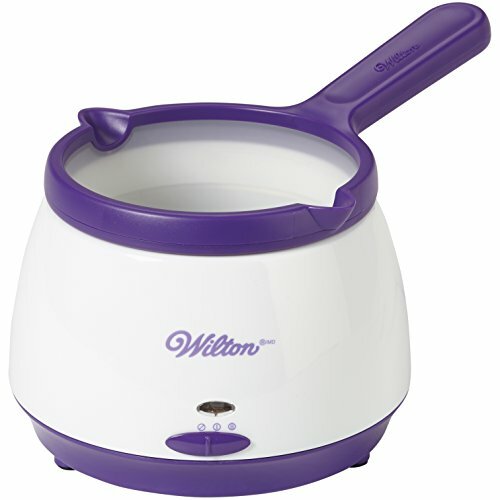 increments) or with Wilton Melting Pot. 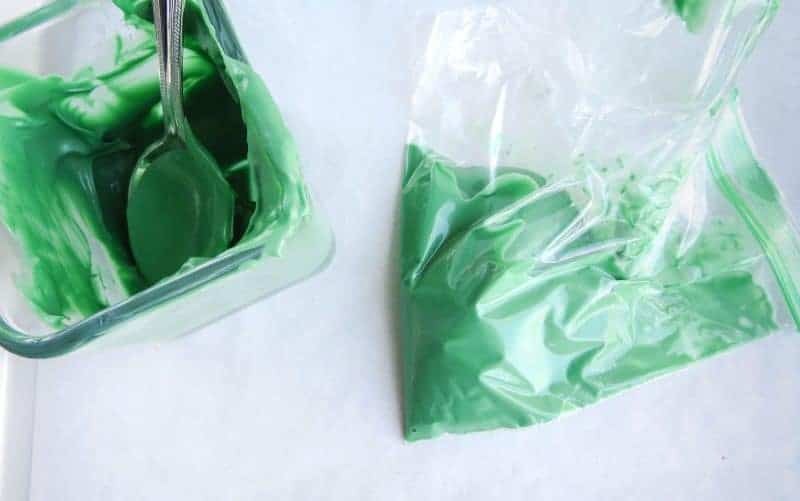 Use a spoon to pour the melted green candy melts into the corner of a sandwich size baggie and snip the corner slightly to create a piping bag. 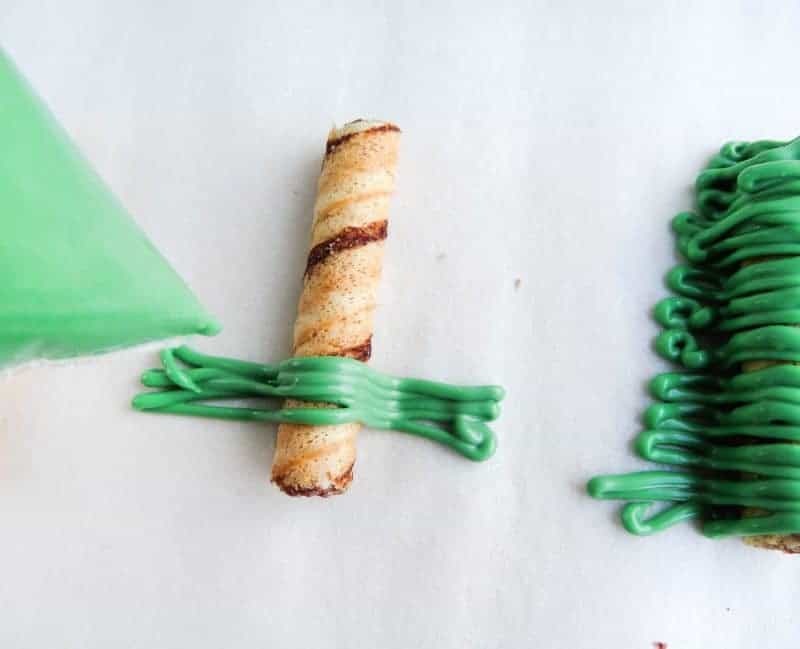 To create the trees, squeeze the green chocolate out of the piping bag in a back and forth motion, starting at the bottom and working your way up to the top. Make sure to start out wide and keep coming in little by little until you get to a point at the top. Make just one or two at a time so you can put the candy decorations on them before they dry. If they do dry, simply squeeze a dot of chocolate where you want to place a candy to help it stick on. When you’re done making all the trees, allow them time to sit and harden (about 5-10 minutes). 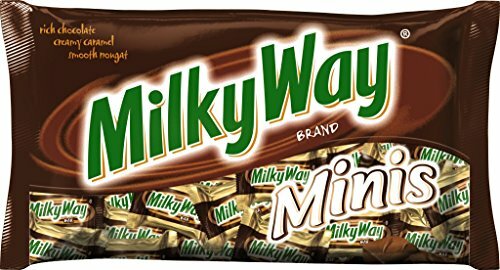 Unwrap Milky Way Miniatures and place in microwave for about 3-4 seconds, to soften very slightly. Then, very carefully push the wafer down into the middle of the Milky Way. Let harden before serving (about 5 minutes). 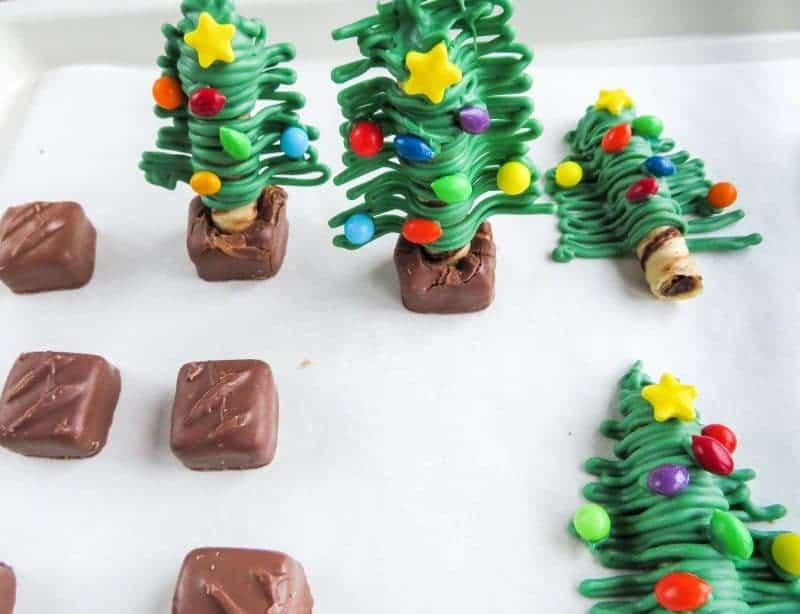 Are you looking for a fun and easy Christmas treat that the kids will go wild for? 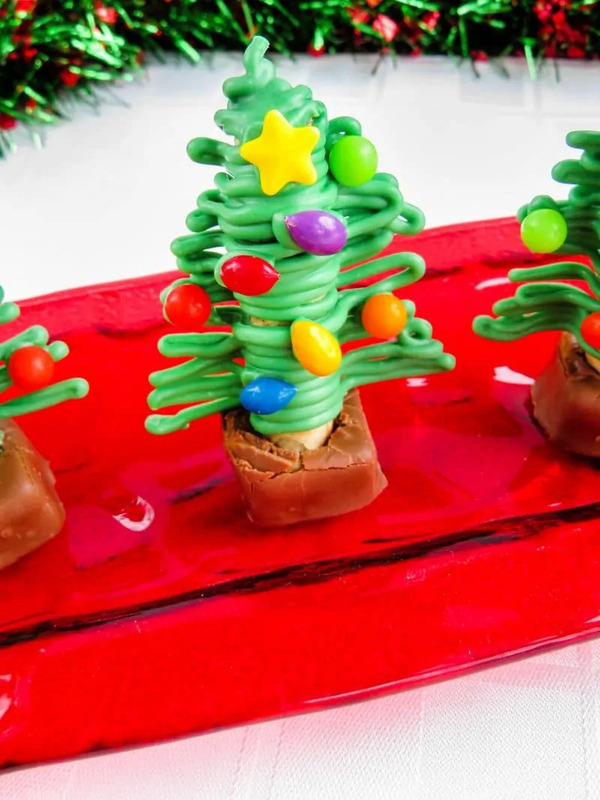 These Christmas tree treats are perfect! 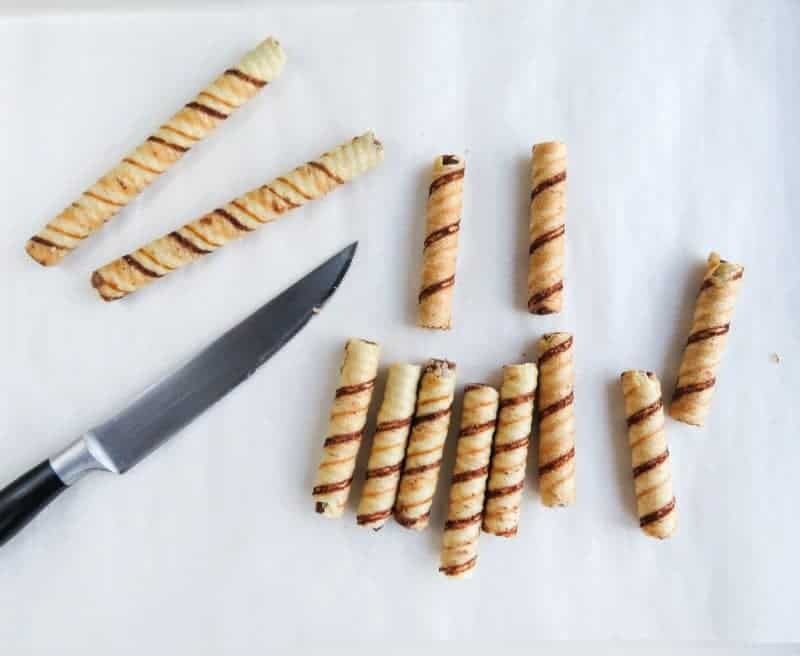 Cut each Pirouline wafer in half and lay on a parchment lined cookie sheet. Make sure to leave enough space in between each to add the chocolate. 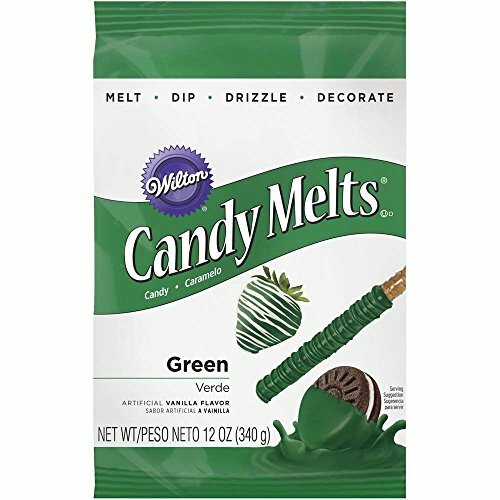 Melt green candy melts in the microwave or with Wilton Melting Pot. With a spoon, pour the melted candy melts into the corner of a sandwich size baggie and snip the corner slightly to create a piping bag. 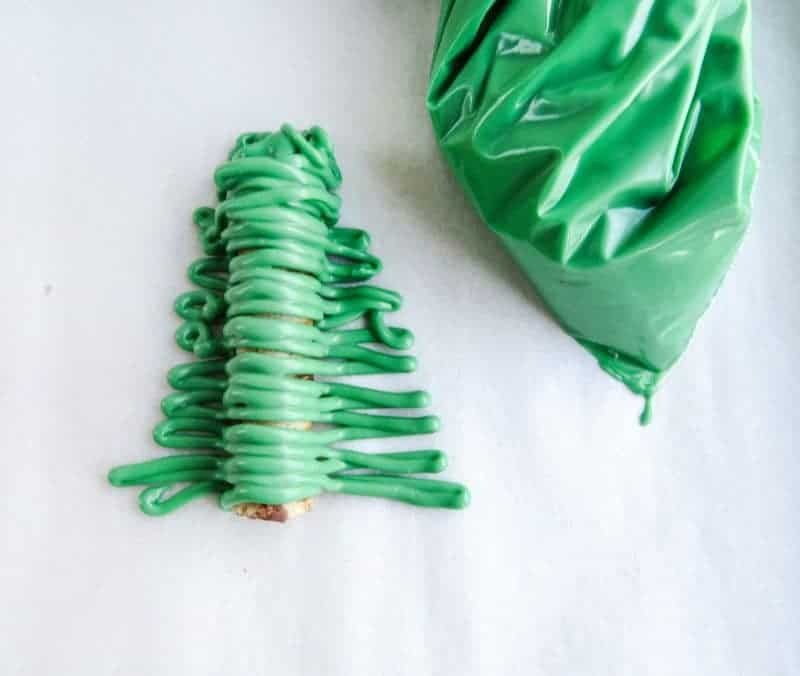 To create the trees, squeeze the green chocolate out of the piping bag in a back and forth motion, starting at the bottom and working your way up to the top. Make sure to start out wide and keep coming in little by little until you get to a point at the top. Make just one or two at a time so you can put the candy decorations on them before they dry. 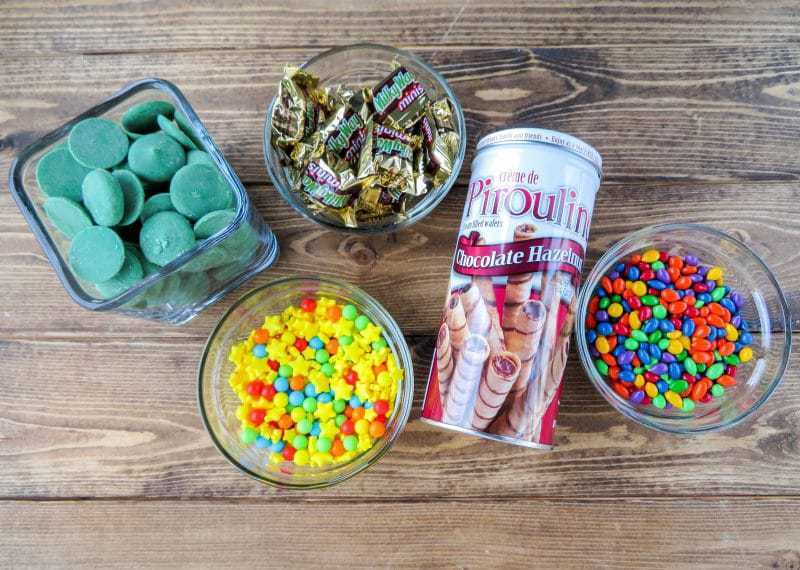 If they do dry, simply squeeze a dot of chocolate where you want to place a candy to help it stick on. When you’re done making all the trees, allow them time to sit and harden (about 5-10 minutes). Unwrap Milky Way Miniatures and place in microwave for about 3-4 seconds, to soften very slightly. VERY carefully push the wafer down into the middle of the Milky Way. Let harden (about 5 minutes) before serving. These are so unique and cute. These are amazing! 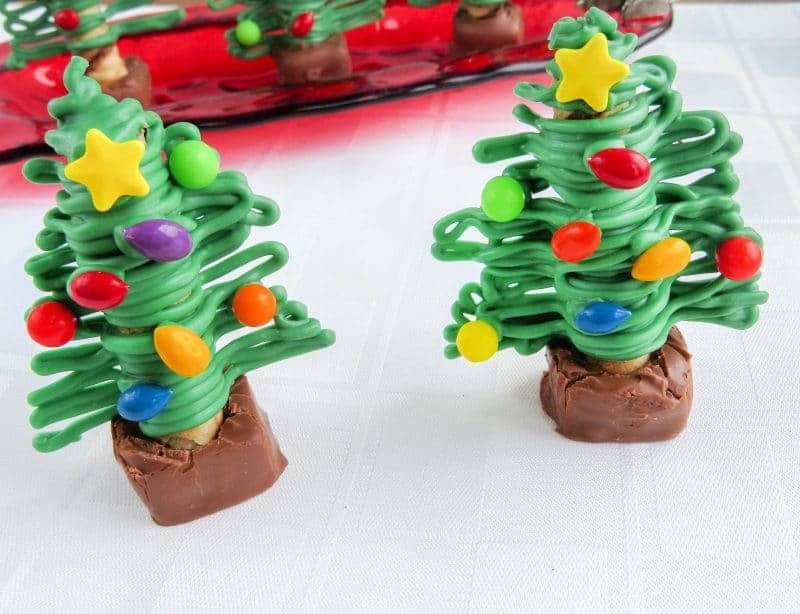 They will be the center piece of any Holiday dessert table! Bookmarked~I will definitely be making these this season! These are so cute and would be fun to make! Oh these are SO fun!! I love the decor! I think id use sixlets instead of jelly beans. 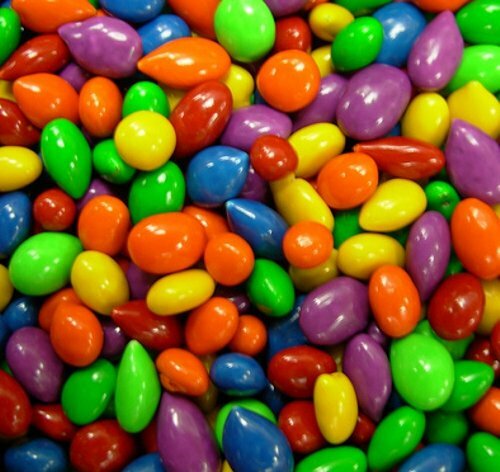 Jelly beans just screams Easter to me! These are super cute and I know they would be tasty. So many options for decorations too! Omg, they are so cute, definitely gonna make some!